Although your toddler will grow out of their baby teeth, it’s important to protect them because children can get cavities too. In children, cavities are called dental caries and without proper oral hygiene and diet, your toddler runs the risk of bacterial exposure that leads to tooth decay. Even if you brush your child’s teeth and ensure that their sugar consumption is at a minimum, there’s still a chance for caries and tooth decay to develop. However, an extra layer of protection can be applied to your child’s mouth in the form of dental sealants. Dental sealants create a barrier on children’s teeth to protect them from the bacteria that causes caries. Without dental sealants, your toddler’s teeth are at risk for tooth decay. When brushing, flossing, regular visits to the dentist and a healthy diet are combined with sealants, your child will have great oral hygiene. Simply put, dental sealants are an additional protective measure for your toddler’s teeth. The dental sealant procedure is painless and does not use numbing medications or drilling devices. The dental hygienist will go deep between the pit and fissure surfaces of your child’s teeth to ensure that all plaque and food debris are removed. The hygienist will also simultaneously clean the teeth before etching their surfaces. Then, the etching material is rinsed off and the teeth are dried. The teeth are etched because sealants bond better to teeth that are rougher and dry. Next, using a special brush, the hygienist will apply the sealant material to the surface of each tooth. This is followed by the use of a self-curing light (approximately 30 seconds) that bonds the sealants to the tooth’s surface. Once the application process is complete, the hygienist evaluates the sealants to ensure that they have fully secured to the teeth. After the sealants have hardened, your child is able to chew and eat as they normally would. Are dental sealants safe for toddlers? 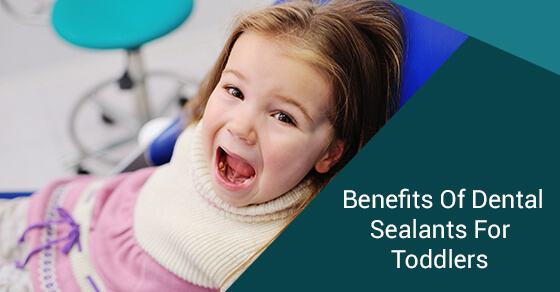 The Canadian Dental Association supports the use of sealants because they are safe for toddlers and have many benefits. The material used contains a very low level of bisphenol A, otherwise known as BPA, but that amount is so minute that there is no health concern. Plus, the exposure to BPA only lasts for a few hours after the sealants are placed on the teeth. Children are already exposed to BPA through the foods and beverages they consume. Moreover, according to the American Dental Association, simply breathing air exposes us to 100 times more BPA than that found in sealants. What are the benefits of sealants for young teeth? There are five specific benefits of dental sealants for toddlers that range from limiting exposure to bacteria to keeping their teeth healthy and strong. Young teeth are at risk for caries. Without the protection from dental sealants, your child could experience a higher number of cavities. Even if you are vigilant about brushing their teeth and feeding them a diet that is low in sugar, young teeth are not as strong as adult teeth. See #3 on how strong dental sealants make young teeth. Caries are caused by bacteria when it comes into contact with leftover food particles. When the two meet, they produce dangerous acids that cause tooth decay and holes in your toddler’s teeth. With dental sealants in place, the bacteria cannot penetrate the tooth and mingle with food particles. Your toddler’s baby teeth are placeholders for permanent teeth. If you do not have sealants applied to their young teeth, they could fall out early and leave a vacancy in the mouth if the permanent teeth aren’t ready to erupt yet. The area where the tooth would be, the socket, is susceptible to bacteria – and without a tooth there, your child could end up with a bout of gum disease. Our back teeth, no matter how old we are, have small grooves and dimples in them called pits and fissures. Food and germs get stuck in these pits and fissures and can stay there for long periods of time because even the best toothbrush bristles can’t brush them away. With sealants, your child’s back teeth are shielded from the food particles and germs that would normally get stuck there. As a parent, you constantly worry about your toddler, especially when they are not with you. At daycare or on playdates, your toddler’s mouth is exposed to germs from sharing toys and foods that they might not consume at home. For instance, you may provide your child with healthy eating options – but other parents may not do the same for their kids and feed your child sugary drinks or fast food. At least with sealants in place, you get peace of mind knowing that your toddler’s teeth are protected. At Dawson Dental, we offer pediatric dentistry. If your toddler is in need of dental sealants, please contact us for more information or to make an appointment.